Russian names consist of three consecutive components, the name, the patronymic (derived from the name of the father) and the family (the surname).Russian names are usually of Greek origin (like Nikolai, Vasilii, Aleksandr, etc) or Latinas as Valentin, leaving those of Slavic origin in a minor set like: Vladimir, Svetlana, Ludmila, which combine with Slav (Sviatoslav, Yaroslav), etc. Today, that the majority of the population is Orthodox and as custom they usually choose the name of the newborn calendar minus 13 days from the date of the current schedule to fit with the old calendar (in ecclesiastical use) and then take the name of the name day. The most common Russian female names are (with their diminutives): Olga (Olya), Tatyana (Tanya), Svetlana (Sveta), Elena (Lena), Irina (Ira), Anna (Anya), Ekaterina (Katya), Maria (Masha), Natalia (Natasha), Anastasi­a (Nastia) and Marina. The most frequent male names are: Sergey (Seriozha), Alexey (Liosha), Andrey, Alexandr (Sasha), Mikhail (Misha), Vladimir (Vova, Volodia), Dmitry (Dima), Nikolai (Kolya) and Yuri (Yura). 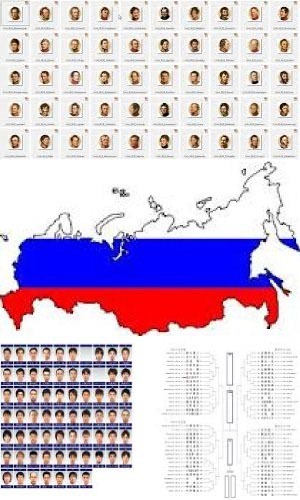 According to a study, from 250 more typical Russian surnames, they identified the 20 most frequent surnames in all Russia (according to popularity): Smirnov, Ivanov, Popov, Kuznetsov, Sokolov, Lebedev, Kozlov, Morozov, Petrov, Volkov, Soloviov, Novikov, Vasiliev, Zaitsev, Pavlov, Golubev, Semyonov , Vinogradov, Bogdanov and Vorobiov. To transform a typical Russian male surname (one that ends with "-ov", "-ev", "-in"), to a female surname, is added the letter "a" at the end, and will be Petrova, Kuznetsova, Volkova, Ivanova, etc. The word "name" in Russian is "Imya". What's your name? In Russian is " Kak tvoyÃ³ imia?" or " Kak tebia zovut?". The answer will be: "Menya zovut....". The word "it surname" in Russian is "family" . Besides the name and surname, the Russians have a "patronymic" (Atchestvo), which is a derivation of the father name and goes after the name. The patronymic take place by adding the suffix "-ovich" or "-evich" (for men) and "-ovna" or "-evna" (for women) to the name of the father, but there are exceptions for other names. For example, if the father name is Ivan Petrov, the name of her daughter is Olga Ivanovna Petrova, if the father is Sergey Popov, the son is Vladimir Sergievich Popov. When they marry, the majority of Russian women usually take the surname of the husband (transformed to the female way), and then this surname happens to children. But it is not compulsory and some women do not change the name. Also, the husband can take his wife's surname; the law is absolutely equal in these cases (although this is done in very few cases). Children can have any name according to the wishes of their parents, but it is usually the father’s name. When a lady divorce, she can leave the surname of the husband or return to maiden name. If she marries again, she can change the name again, and so on. In fact, by law, any Russian person has the right to change the name and surname to anyone at any time, if they do not like it for some reason.